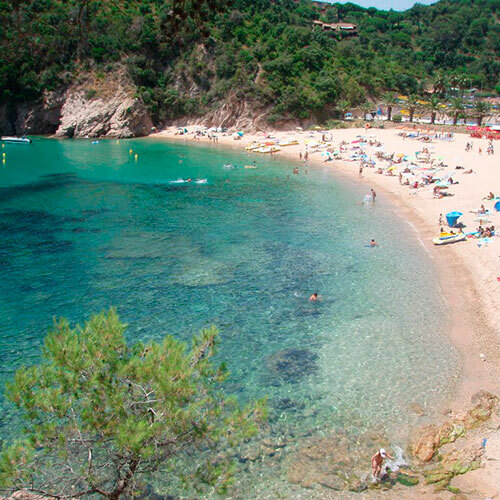 Tossa bay is one of the most significant in the area, a large beach with a number of coves, in the summer season its full of tourists. Situated at the foot of the ‘L’Adrenya’ mountains a beach of coarse golden sand, only 80 metres long by 50 metres wide, it is well protected from the wind, due to its location. In the middle of the beach is a small river that runs down from the ‘Macis de Cadirertes’ and to the left is the wall maintained walking trail, ‘Camino de Ronda’. 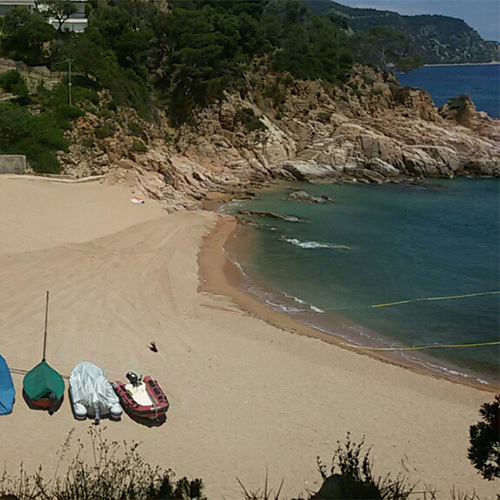 Situated on the boarders between Tossa de Mar and San Feliu de Guixols. A virgin paradise that can be reached by foot from the main road, around 300 steps cut of of rock. Surrounded by pines, a contrast to the transparent turquoise waters. 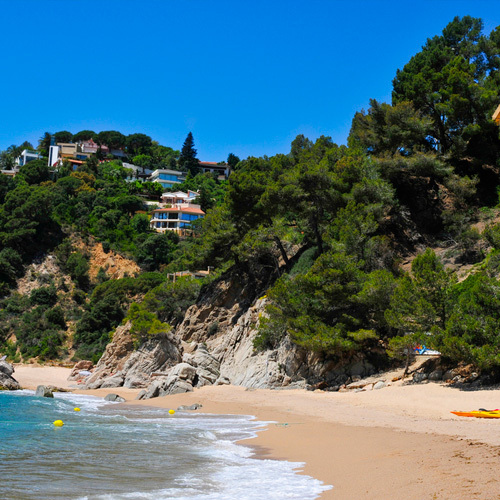 The Costa Brava is home to Cala Giverola, a cove located in the incomparable setting of Tossa de Mar. 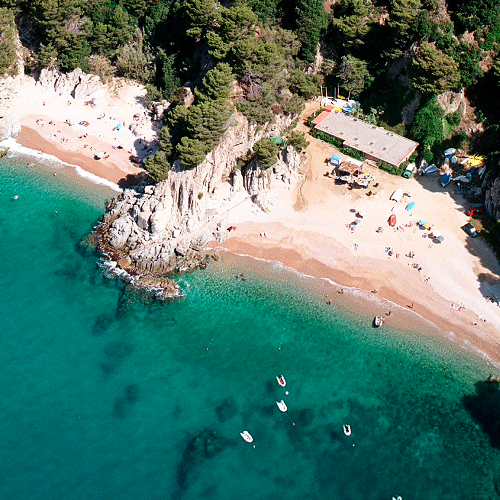 Surrounded by cliffs and pine trees, with a tourist complex at the foot of the beach, only a few meters from the sea. It facilitates the rental of sports equipment and various activities. We, at Fondo Cristal, make this a mandatory stop on all our tours. Cala Pola, about 75 meters long, is located in a rocky cove that gives it an extra special beauty. This cove is a point of arrival and departure of underwater viewing boats and tickets can be purchased right there. Cala Pola offers good services: showers, a supermarket belonging to the campsite, beach bar, etc. Home to many points of interest that make it such a unique little cove. 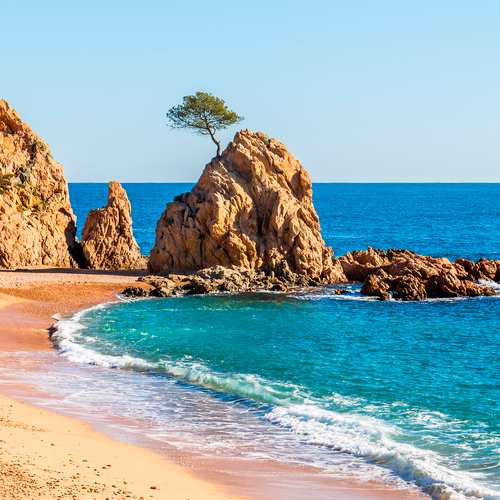 Cala Bona hardly has room to spread a towel and contains very few meters of sand, but despite its size, it is a fantastic cove to snorkel and it has a great natural protection against waves and wind. Found to the extreme north of the main beach, measuring 100 metres and enjoys a blue flag status. At its disposition of all services. The quality of the waters is periodically controlled. A more intimate environment than the main beach with coarse grainy sand. 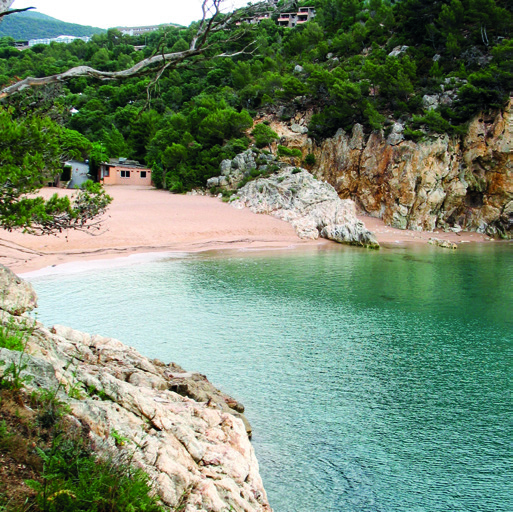 Is a tiny beach in the rocky separation between the main beach and the Mar Menuda beach. A small area or sand amongst the rocks that can be accessed by steps which are cut out from rocks, it is the smallest beach measuring only 15 metres. 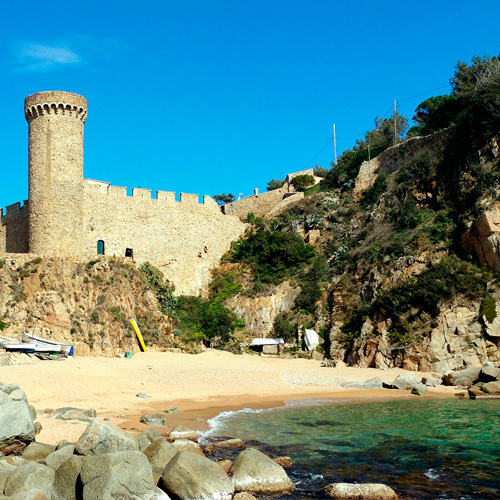 Is the principal beach of Tossa that surrounds the walled part of the town. Considered by the National Geographic as one of the 25 best beaches in the world. 400 metres long with coarse sand and easy access, availability of all facilities and areas for boats. Of small dimensions but this does not distract from its great beauty and its clear blue transparent waters. 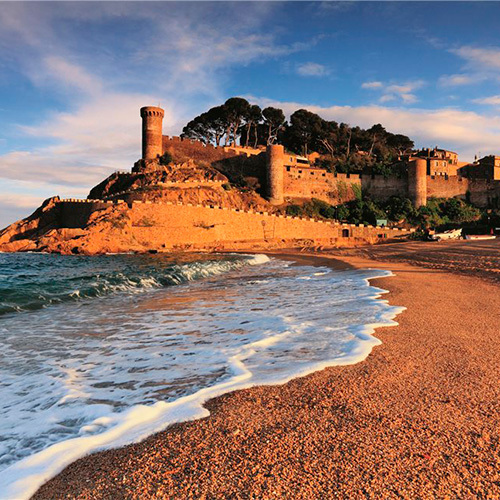 With the medieval walls as a back drop and crowned by the tower of the same name as the bay ”Es Codolar”. With small fishing boats on the sea and not forgetting long ago in this same place is where the old port of Tossa was situated. On the right and left walking trails complete the landscape. 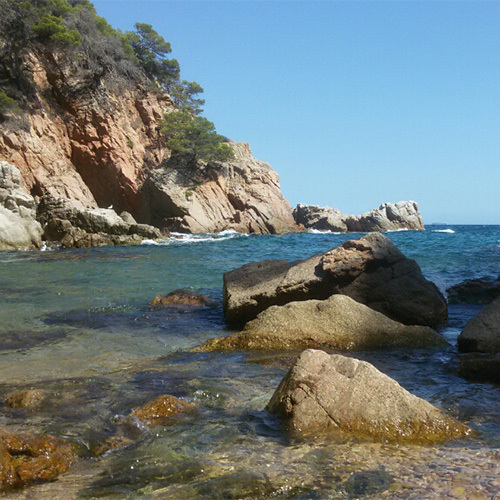 A beautiful small stoney beach which can be accessed by foot through camping Cala Llevado, a walk of 10 minutes. Cristal clear waters with a rocky landscape and full of vegetation, it is distant from noise and pollution of the city and vehicles. 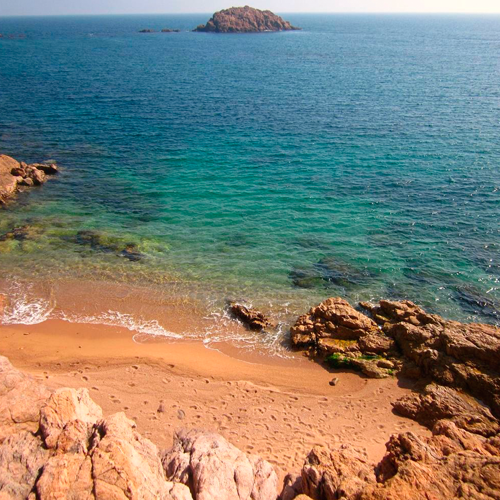 Is a bay situated in a natural environment orientated to the south and with golden sand. 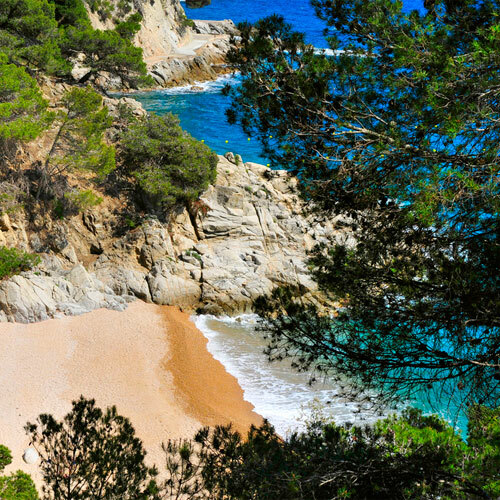 It is 130 metres long and 50 metres wide, adjacent to Cala Figuera. 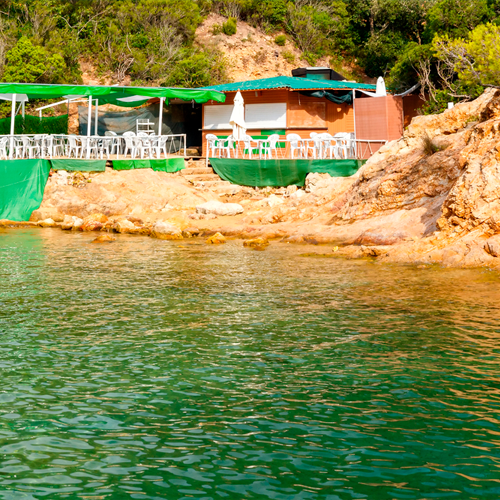 It forms part of the bay of Santa Maria de Llorell with the service of a small beach bar and showers. 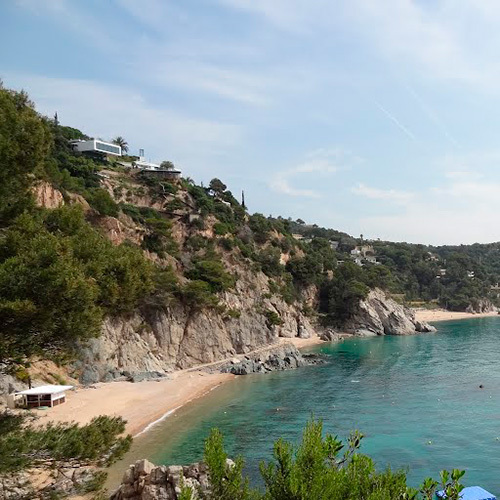 The only nudist beach in Tossa situated in a privileged setting amongst an interesting rock formation, it is protected by the cliffs and accesses through the typical vegetation of the area. Is the most important beach of the Santa Maria de Llorell bay, Almost 500 metres long with easy access by car and offers many amenities for visitors, mainly families. With its rocky formation which permits the practice of watersport activities. 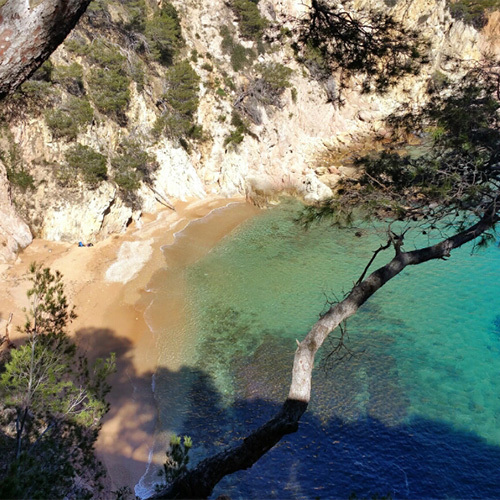 Situated to the extreme south of Santa Maria de Llorells a natural beach with cristal clear waters, you can reach it by the walking trail from the ‘Llorell’ beach. Characterised by its rocky beauty it contemplates the wonderful views. 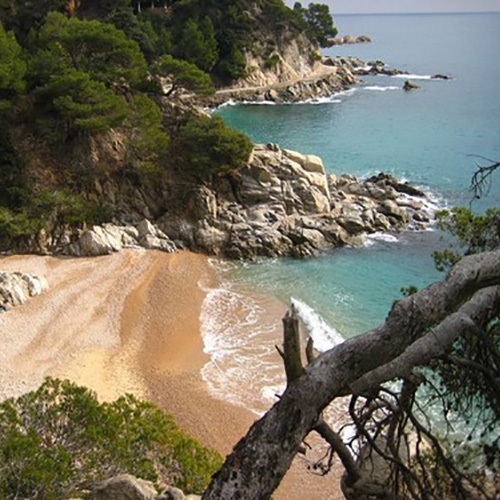 A spectacular virgin bay with no facilities, situated between Lloret de Mar and Tossa de Mar, south of ‘Playa de Llorell’. It is hidden from the other near beaches, with cristal clear waters you can only arrive by foot or boat. Located away from all housing urbanisation’s.